Easily one of the most famous super heroes of all time, Spider-Man made his debut in Amazing Fantasy #15 which came out in August 1962. 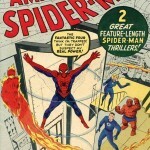 Below are values for The Amazing Spider-Man #1 comic book which was released in March 1963. It’s actually not difficult to find The Amazing Spider-Man #1 comic book for sale, as the high value tends to bring out sellers who are willing to cash in. The values above are from completed public auctions – and don’t reflect things like grading fees, ebay/PayPal fees, shipping fees … ect – but they should give you a good idea what The Amazing Spider-Man comic book #1 is currently worth. The value of this comic book, like many from the Golden-Age, is based mostly on the condition & if there are any restoration attempts. 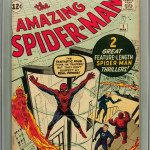 If the comic book you are trying to buy isn’t already graded/authenticated by CGC or PGX, you’ll want to make sure the book is complete & there are any major restorations – as this will make the book less valuable. 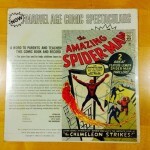 This entry was posted in Comic Book Values, Marvel Comics, Spider-Man, Spider-Man and tagged Comic Book Values, Marvel Comics, The Amazing Spider-Man by Comics Watcher. Bookmark the permalink. Thanks for the question. 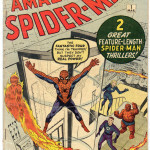 I believe what you have is the “Golden Records” Amazing Spider-Man #1 comic book, which was a reprint of the original version published in 1966. This reprint actually has decent value depending on the condition. NRMT-Mint copies sell between $500 – $800. 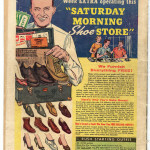 Copies that have been used a bit are usually in the $200 – $300 range. I’ve added photos & values for the Golden Records reprint above for reference. Nice find! Any idea on values for the golden record? I have the record but no comic..
Good question. 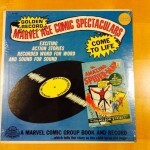 I’ve seen the Spider-Man Golden Record without the comic book sell in the $30 – $40 range online. Hope that helps.